Katie Stewart trained at London Studio Centre and since graduating has gained extensive singing experience. 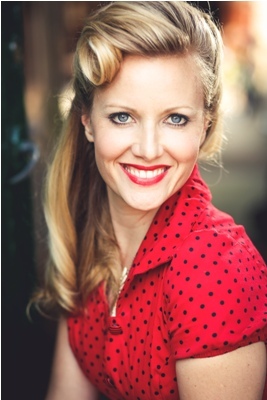 She has been involved in many professional musical theatre productions both in the UK and abroad. Lead Vocalist (P&O Cruises) Boogie Nights (UK Tour), Frank, Dean & Sammy (UK & Asia Tour) Starlight Express (Germany), Jest End (Leicester Square Theatre, London) Wonderful West End (UK Tour). Over the past 5 years she has performed in many pantomimes including Aladdin, Cinderella, Beauty and the Beast and Peter Pan for Bill Kenwright LTD. Last year she was asked to perform for the Monaco Royal Family for a prestigious charity event in Monte Carlo. Katie has sung at numerous weddings and corporate events over the last few years at The Natural History Museum, One Whitehall Place, The National Heritage Museum, Grovesnor House Hotel, Troxy and Westminster Hall amongst many. She is also a regular session singer for SBI Global. Katie has always had a huge love for Big Band music hence many of The Nightingale's song choices! She adores Frank Sinatra, Tony Bennett, Micheal Buble and Natalie Cole to name just a few and has spent countless hours listening to their music on the way to gigs over the years! Katie is a wife and a doggie mummy to Pip (her maltese terrier!) One of her favourite pastimes is having a cuppa with Emma eating chocolate biscuits and putting the world to rights!!! She is also a hopeless romantic at heart and absolutely loves having a job that allows her to sing at weddings!